Here are my reflections of my fourth century. I was looking forward to heading south from Buckingham. I had fond memories from 2005 of the easy cycling through Chetwode, Stratton Audley and Lawton. Happily, my memory wasn’t playing tricks. I bowled along at an easy 17mph much of the way, eating up the miles. I can’t remember a single car overtaking me. This was a perfect interlude before tackling the hills around Ashendon. Almost 10 years ago, we started a bike ride from Ludgershall in Buckinghamshire. It’s one of those villages that stretch around common land. Yesterday, I delighted in propping my bike against a bench by the village pond, while I had a rest. I chatted to an angler who was enjoying fishing. The break got me ready for the final 35 miles. The last time I did this century 10 years ago, I made do with a snack lunch from Tesco in Buckingham. This time, I did much better. I found a Prezzo opposite the Old Gaol museum. 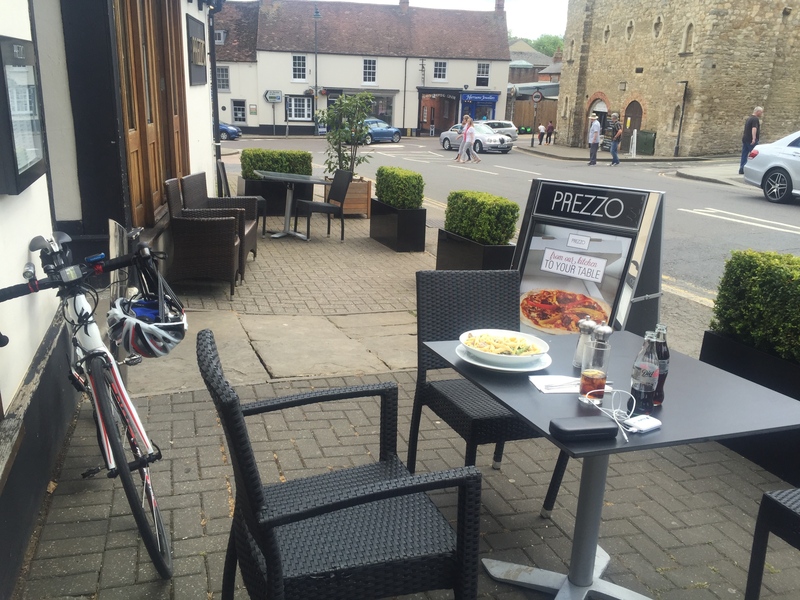 I relished a pasta meal in the sunshine, bike by my side, as I watched some lively characters enjoying a few pints and greeting their mates loudly outside the Kings Arms on the other side of the road. The only complication was paying the bill on the Prezzo app with PayPal: I could barely see the screen on my iPhone! Two years ago, I moaned about the failure of my Garmin to provide turn by turn directions on my big bike ride from Wales to Buckinghamshire. In truth, it was user error. You have to switch this on for a course you have created. This time, I got it right, and it worked a treat. I created the course in Strava and uploaded it to the Garmin. Next, I made sure turn by turn guidance was on in the settings for that course. It was a godsend, given I wasn’t carrying any maps and relying on Google or Apple Maps was out of the question given the poor data signal. There were a few junctions where the Garmin didn’t tell me what to do, but it soon told me I was off course. Mind, there was one time I was swooping down a hill after some 80 miles when the dreaded off course signal sounded. Fortunately I soon got the course found alert. I was glad I didn’t have to climb back up that hill! This was my first century on a road bike. I carried most of my stuff in my Camelbak Rogue. But I didn’t want to overburden my back, so the day before the ride I bought the Topeak TriBag from Richmond Cycles. What a great product. I kept my energy bars, suncream and tissues in there, for easy access. Highly recommended. I also had a Topeak saddle bag for tubes and more energy bars, plus energy booster packs for the phone and Garmin. Strava has become the hit cycling app. Even I, a very uncompetitive and slow cyclist, have revelled in beating my personal best. (Beating my goal of 3 minutes 15 seconds for the Clay Street climb to Beaconsfield by 12 seconds this week showed I was getting stronger.) As I recounted in the blogpost looking forward to yesterday’s century, I felt a bit of a cheat entering three mile rides in Strava. Finally, I have completed a ride (163km) that more than meets the Strava Gran Fondo 115 challenge. Not sure I’ll pay $120 for the shirt to prove it, mind! PS; Just in case the Garmin failed me, I tracked the ride on Strava on my iPhone 6 Plus. (I normally upload my rides from Garmin to Strava.) My caution wasn’t justified, but I was very impressed with the iPhone’s battery life. At lunch, after four and a half hours, it was still showing 80% battery remaining. This is the beauty of the Strava/iPhone combination. I knew Britain’s roads were in a state before my latest century. But yesterday showed again how poor road surfaces make cyclists suffer. I had to steer a careful path between potholes and scarred road surfaces. I was lucky that the fast downhills (maximum speed 38mph) were on smooth roads otherwise I’d have come a cropper. The only positive was that Hertfordshire appears to be resurfacing its roads – even the lanes. 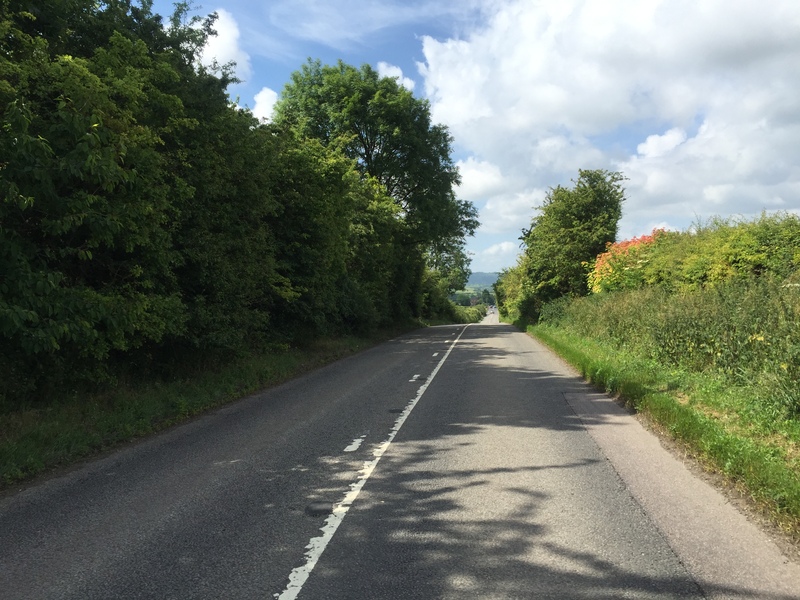 The route from near Cholesbury to Tring (Kiln Lane, Marlins Hill and Hastoe Lane) was covered in gravel – slightly disconcerting, but better than potholes! I was suffering by the end of the ride, But that had nothing to do with the bike. 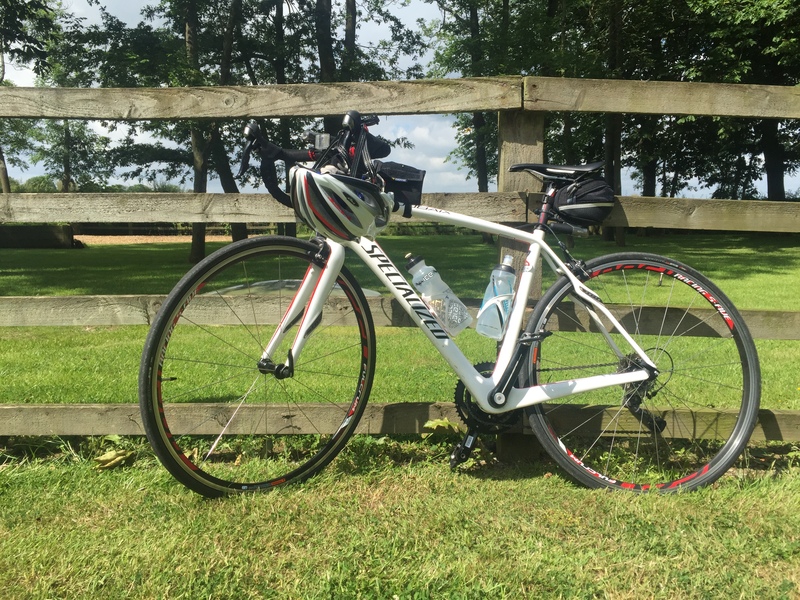 The Specialized Roubaix was a lovely bike to ride hour after hour. It was far more comfortable than I expected a road bike to be. I didn’t miss the third chainwheel, as these gears are perfectly spaced. And it was a delight to ride fast. I can’t wait for our next big ride. 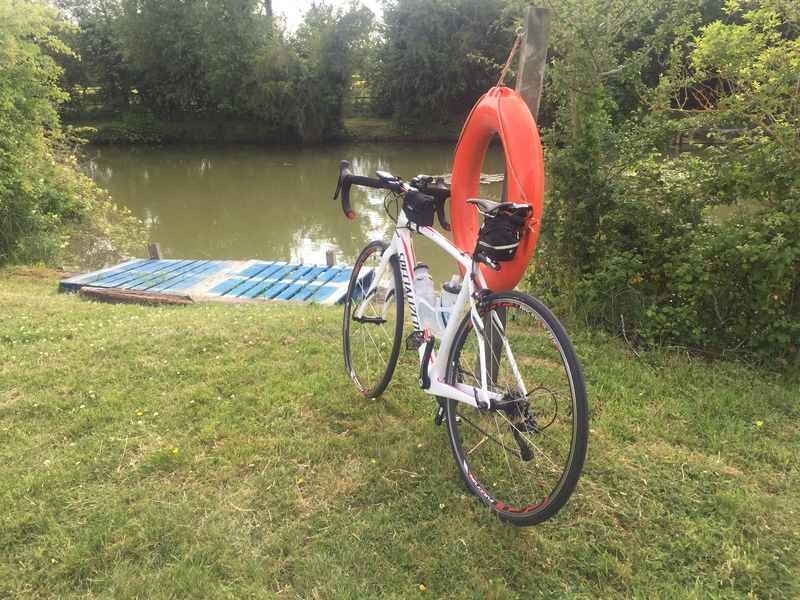 This entry was posted in Buckinghamshire, Cycling and tagged Cycling century, Garmin, Prezzo, Specialized, Strava, Topeak by Rob Skinner. Bookmark the permalink.